Lithograph, etching, aquatint, relief, engraving, screenprint, and collagraph on white TGL handmade paper. Inscribed “A.P. 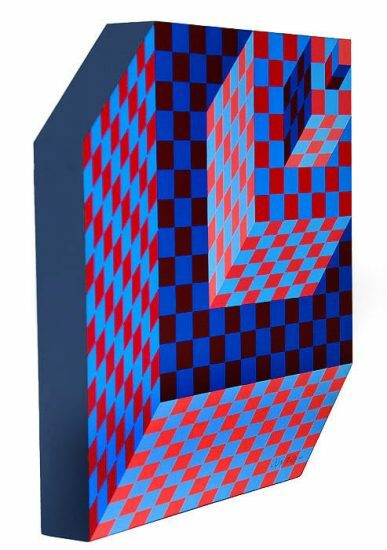 8” (Artist Proof), one of 8 Artist Proofs; aside from the numbered edition of 30. Published by Tyler Graphics Ltd. 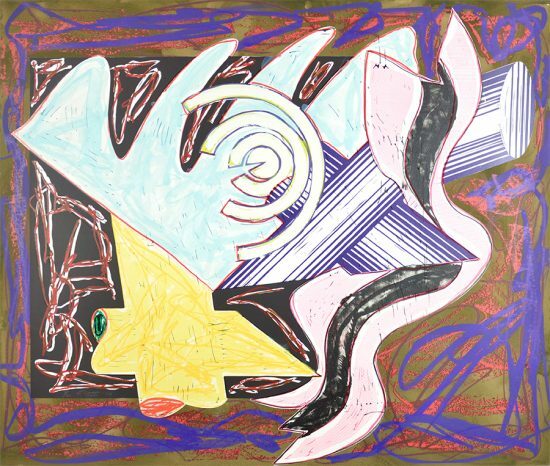 This work is hand signed by Frank Stella (Massachusetts, 1936 - ) in pencil in the image lower right. 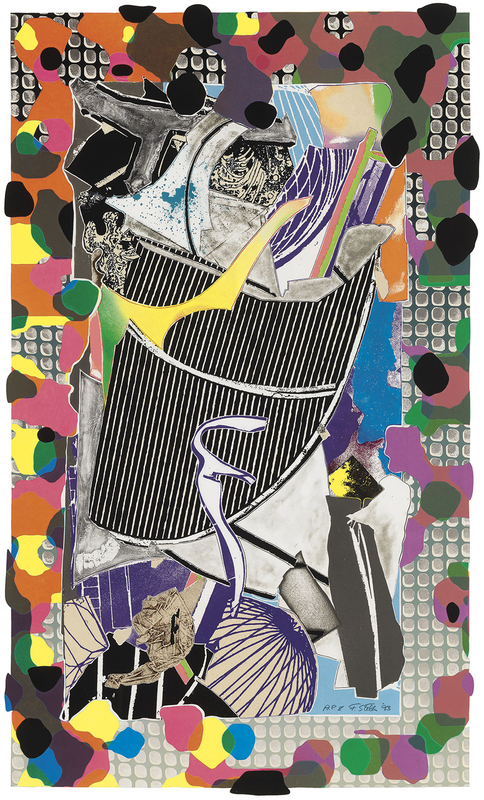 Frank Stella The Battering Ram, 1993 explores an abstract narrative that focuses on color, shapes and composition. 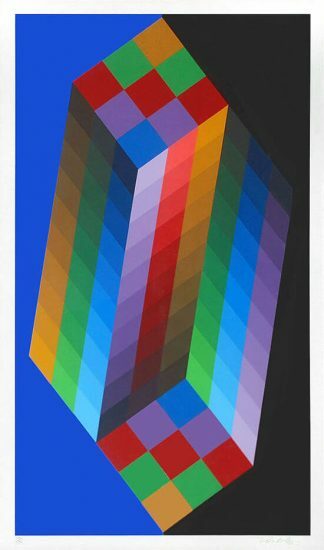 This exquisite large-scale work composed of non-painterly elements challenges the viewer to interact with an array of designs that use color and shapes to create tension and movement on a flat surface. 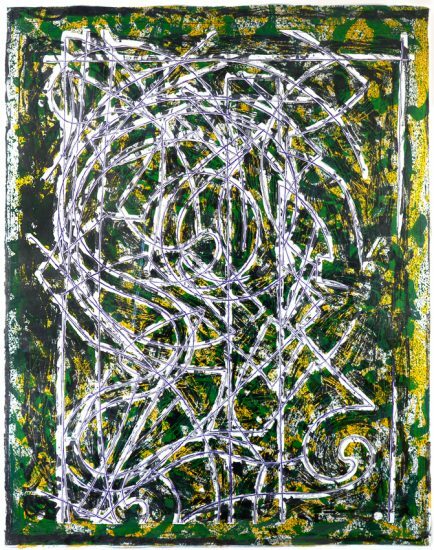 A wonderful mix of geometric and organic shapes in various hues of yellow, orange, green, blue and black run along the border of the work, framing a complicated central composition. A curving swath of parallel black and white stripes dominates this central design, made more intricate by a collection of disparate shapes in a variety of colors and stripes playing on top and along the edges of this swath. These shapes, as well as a grid-like pattern of dots appearing to underlie the entire pictorial plane, give the illusion of a three-dimensional work moving and playing to its own harmony. The complexity of the design mirrors the complexity of using a variety of artistic techniques to create this piece, a process for which Stella is renowned. This work is thus a testament to Stella’s superior technical ability, as well as the creativity that led the artist to become a key figure in American modernism. 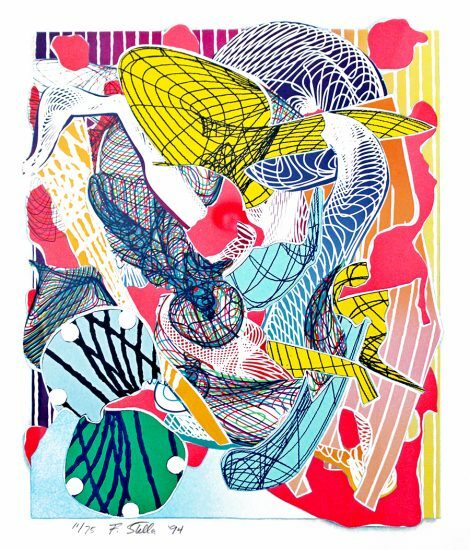 Created in 1993, this lithograph, etching, aquatint, relief, engraving, screenprint, and collagraph on white TGL handmade paper is hand signed and dated by Frank Stella (Massachusetts 1936–) and inscribed “A.P. 8” (Artist Proof), one of 8 Artist Proofs; aside from the numbered edition of 30. 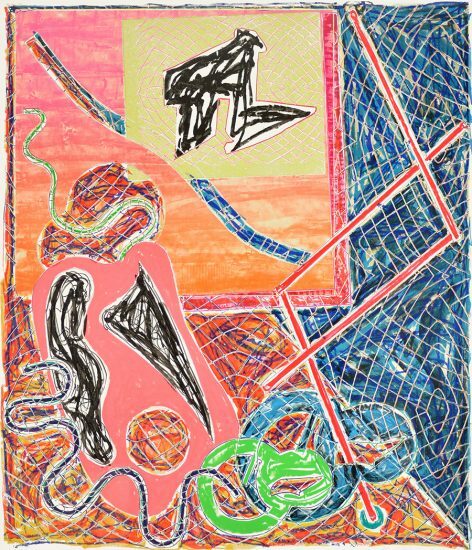 Published by Tyler Graphics Ltd.
Frank Stella The Battering Ram, 1993 is fully documented and referenced in the below catalogue raisonnés and texts (copies will be enclosed as added documentation with the invoices that will accompany the sale of the work). 1. 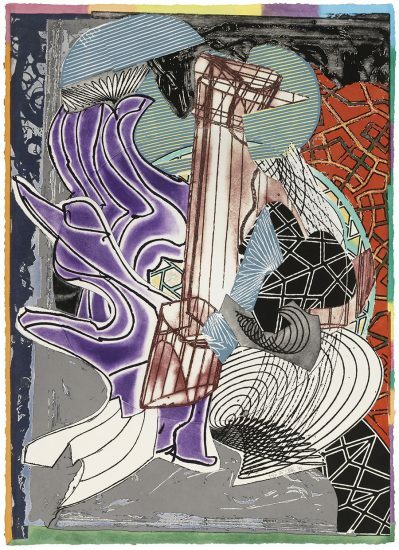 Axsom, Richard H. Frank Stella Prints: A Catalogue Raisonné. New York: Jordan Schnitzer Family Foundation, 2016. Listed and illustrated as catalogue raisonné no. 214. Framed to museum-grade, conservation standards Frank Stella The Battering Ram, 1993 is presented in a complementary moulding and finished with silk-wrapped mats and optical grade Plexiglas.